Working on low and high-tech research, design, exhibition/event, intervention and web/publishing projects with the UK-based Adaptable Futures group. Adaptable Futures "unpacks adaptability in detail looking at the complex web of dependencies that induce, hinder, and accommodate change. 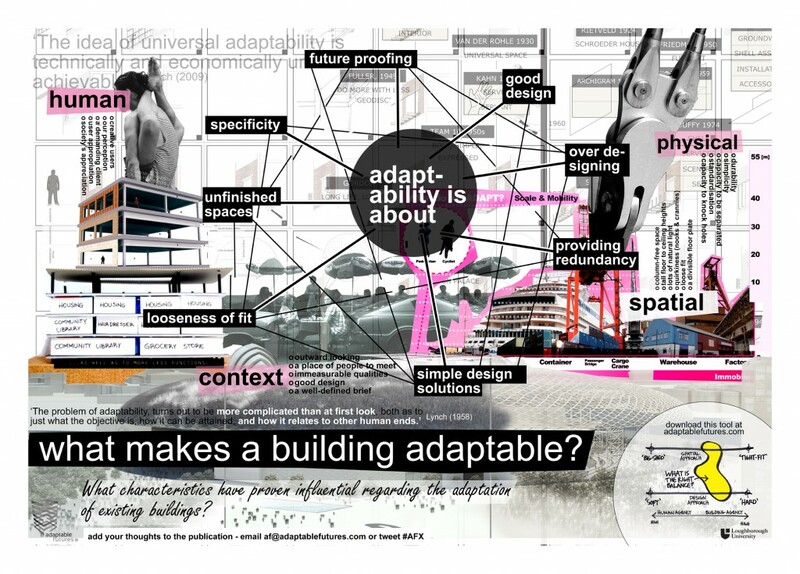 The research asks what can we learn from history - how have buildings been designed for adaptability and how have they been appropriated? It highlights layers, time, and context as primary dimensions regarding adaptability." A collaborative project involving contributors from diverse countries. Using my FIXing Tokyo study as a starting point the project explores the implications of frugal DIY for engineering and architectural practitioners and organisations. A series of collages on the topic of adaptability with each collage providing a different perspective on the topic, framed around a frequently asked question. The collages provide a glimpse into the array of research that the Adaptable Futures group has conducted over the past four years.